After trying the new control template the thing it was missing was 360 compatibility. I am still looking into the wii mote as I think the contrast between the looks of a typical wii mote with the paintbrush shaped nun chuck will highlight the union of art and games which my project is trying to achieve. 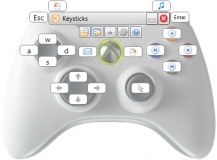 I know there are free alternatives out ther like key to joy but iv had bad experiences with anologe sticks pulling to the left and stuff before whitch this program somehow fixes. And this is also a test for the new controle template using the placeholder art for the house interier.